It’s called “minimalist exercise” and my “Minimalist Exercise Program” teaches you why less is more and what you need to be doing in order to create a workout that “counts” as actual fitness-improving exercise. Although “minimalist training” is about getting the most benefit out of the least amount of time it is not about putting in as little effort as possible to obtain maximum benefit. You don’t have to be a rocket scientist to figure that one out: Putting in no effort equates to no benefit. It’s important to understand that not all exercise really qualifies as “effective exercise” training. It may be fun and burn some calories and contribute to some weight loss results, however, if it’s not set up optimally, then it’s not really “effective” training. There are key factors that need to be addressed by any type of exercise in order to be considered effective and there is one form of exercise that easily addresses all of these areas of concern much more than others do. 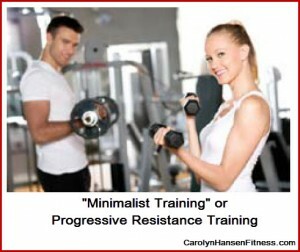 That exercise is “progressive resistance training”…otherwise referred to as strength training. It is simply the most beneficial exercise for your overall health level and one that needs to be included in every adult exercise routine as he or she grows older in order to maintain strength levels, boost energy, protect against disease, promote anti-aging and tone up their physique. Unfortunately, the sad reality is that in today’s modern world, most adults are not even achieving the minimum recommendation for movement in their day to day lives never mind achieving the minimum recommendation for intense exercise. In other words, they are not even doing enough to sustain good health and unless they change their ways, are on a one-way track to disease. Strength training is not meant to replace your love of other forms of fitness. If you love to take vigorous walks with your friends, or participate in other activities like yoga you should keep it up and simply add resistance. The point is, if you are not already “strength training” you need to add it to your weekly schedule. This is about balance…and strength training needs to be part of that balance. Minimalist training offers many benefits that make it the obvious choice for maximum benefits with the shortest amount of time commitment and as a bonus, also one of the best strategies for helping to promote faster rates of fat burning in the body. Doing “minimalist training” means working at a higher total level of intensity as that is one of the guiding factors in my approach. The more intense your exercise session is, the more metabolic boost you will receive after the workout session is completed meaning you continue to burn calories at an accelerated pace for hours to come ramping up the total rate of fat burning. But, not all “minimalist training” is created equal and the primary reasons that many people fail to see the benefits they should be experiencing from “minimalist training” is because their training was never set up properly to begin with. What’s the use of putting all that effort into strength training if you are not benefiting properly and gaining the results you hoped for? Minimalism is where effectiveness meets efficiency, or the point where we have the least amount to do to be successful. “The Minimalist Exercise Program” offers a complete structured ‘minimalist training program’ that takes all the guess work out of setting up the perfect, effective “minimalist training” program and quickly gets you on the path to results. You’ll also receive other bonuses like my “Minimalist nutrition” program that teaches you not to eat less but better.